Simply curious what you all have done to your Scorpions. I’m trying to figure out the best brace setup for my pistol, and leaning towards a Tailhook or SB Tactical Evo. Have added the AK safety selector, KAK blade kit (which is going bye bye, want a folder), Paske grip and Streamlight HLX. Still debating between a Romeo or Holosun optic. Lastly, and purely cosmetic, does anyone know if the carbine faux Suppressor would fit this gen 2 pistol? What have you done to make it “yours”? And for those that run the above referenced braces, what are your thoughts? Mine is an SBR'd Pistol, and other than the red-dot and folding charge handle (not shown, and I really don't recommend) its OEM. I added the 922 parts kit along with the safety delete for the right side and when it came available I added the rifle forend as I usually shoot it suppressed. I still have hope that suppressors will come off NFA at which time I'll get a shorter suppressor! I simply added a brace and an adapter to allow the brace to fold to the left opposite the ejection port to my Scorpion pistol, and a green laser. I bought 24 extra mags instead of adding anything else. So it fits and an old briefcase with 6 of the mags. I've been tempted to put the short handrail back on for the same reason, it'll fit in a laptop bag that way too, or CZ's handy-dandy case, which is surprisingly inexpensive but not to discrete as it says CZ on the side in big letters! I love that Tailhook setup and I also hope the suppressors fall off the NFA requirement. 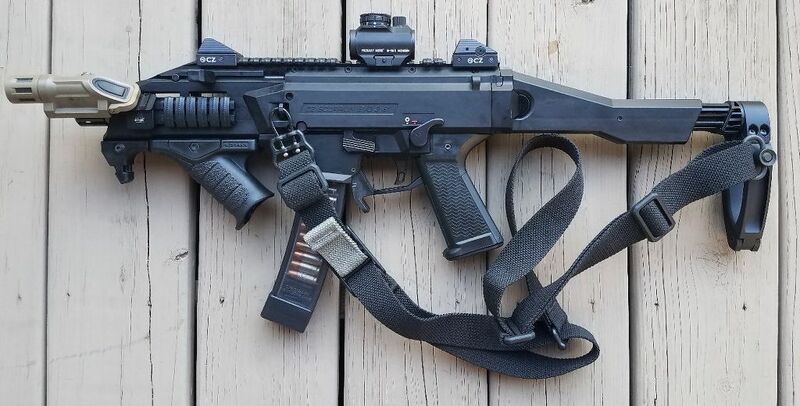 Thought about a slip over faux Suppressor purely for asthetics but a folding brace in lieu of the KAK and shockwave are my priority so I can fit it in my Hazard 4 sling pack. It came with 4 Manticore 32 round Steel lipped mags, but I’d love some more to keep on hand, too. I had a HBI micro K barrel and handguard installed. 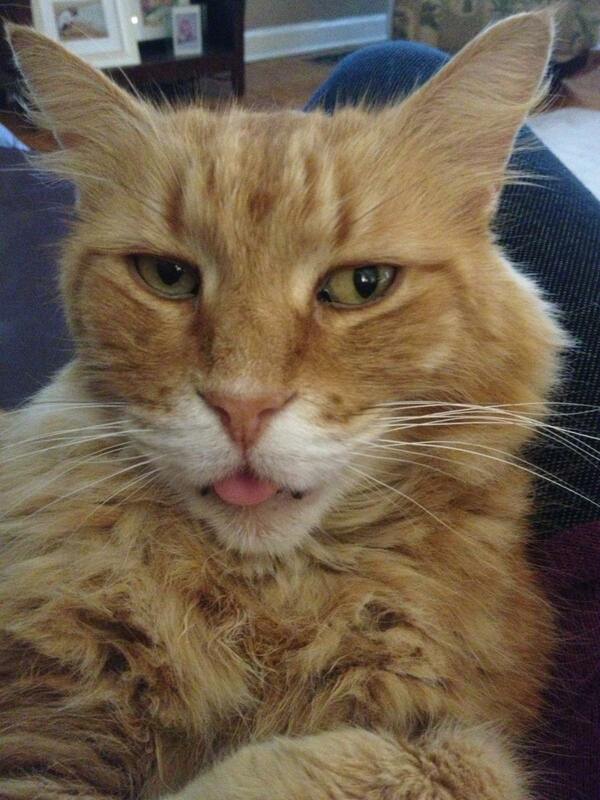 It is very conpact. Barrel also has a 3 lug for an Omega 9k pending approval. I will also SBR it and get a zhukov folding stock. I also hope the suppressors fall off the NFA requirement. Fat chance on that, don't hold your breath. I also love the tailhook look! Red flat face trigger shoes and reduced power trigger springs. The pistol has an unknown folding mechanism and a Shockwave blade. The best upgrades I have done are to put on the extended charging handle, the HB industries reduced spring kit, the Paske grip and AK style safety switch. But what has made the most difference to me is that I sent the trigger pack to Shooters Element to have the trigger polished. It was very inexpensive and turn around time was about a week. I had my carbine and pistol both done. It makes shooting them a whole lot more fun. I will also SBR it and get a zhukov folding stock. Just curious, why the Zhukov folding stock over the factory folder? I had that set up didn't care for it. I'm 5'7" but the adapter adds a little over an inch and even with the stock collapsed it was kind of long for me, plus the texture and color don't quite match; so I sold it at a gun show to a vendor that had a Scorpion for sale ... I like the Zhukov stock on an AK with the correct funiture. The Zhukov stock and adapter run about $175 ... in the the factory kit your get the stock, as well as the US parts (trigger, sear, mag base plates and followers) for $200. I’ve tried both factory and zhukov setups. The zhukov fits me better and I like that it has a higher cheekweld. Well, I have owned a Evo since 2015, but didn't shoot it much for several years. I did drop a Form 1 on it while using a Shockwave pistol blade and tube on a Hera Side folding setup. Topped it off with a Trijicon MRO in a low mount and a HBI charging handle & safety. I liked the weapon but over the last year have come to dislike the railed OEM forend, 7" barrel, and the need to use a thread adaptor to use my Tirant suppressor. 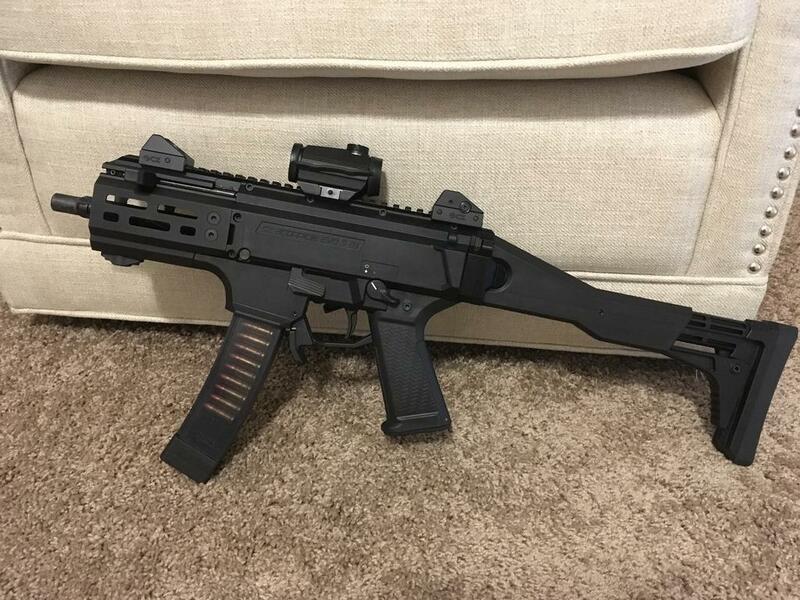 So recently I purchased the HBI Scorpion K kit, which comes with a short 3 lug barrel & 1/2x28 threads, short MLOK rail and all the attachment hardware. Installation was easy and I can confirm that the HBI metal charging handles DON'T like working with a metal forend (which HBI states upfront), so I swapped back to the OEM CH which is polymer). Not my pic, but mine now looks like these examples and is a HUGE upgrade IMO. So handy and getting rid of the railed forend & longer barrel makes it so nice, with or without a suppressor. I put 200+ rounds though mine today, initially zeroing the MRO at 25 again after the barrel swap, then moving on to 7 & 15 yard short range drills. Anyone considering doing the "K" conversion, I highly recommend it! Oh, I also have a couple of the new OEM 30rd magazines on the way - they look more like PMAGs that the originals. This is a perfect setup for me. I’ll eventually add a red dot, but wanting something light. Once I set mine up with the mods it has become of one my favorites I’ve ever owned. Love the thing. When I fold the brace it fits in my work provided laptop bag. A couple of extra magazines and the backpack has a total of 140 rounds. Once you mod it, especially the trigger, safety, and charging handle, it’s night and day from stock. I take it with me often where I used to take my SBR. It’s smaller, more convenient, and since mine is technically still a pistol, I can carry it anywhere. In a Kenneth Cole backpack, nobody looks twice. Let me know and I can take pics and upload them pretty quick. Good luck. 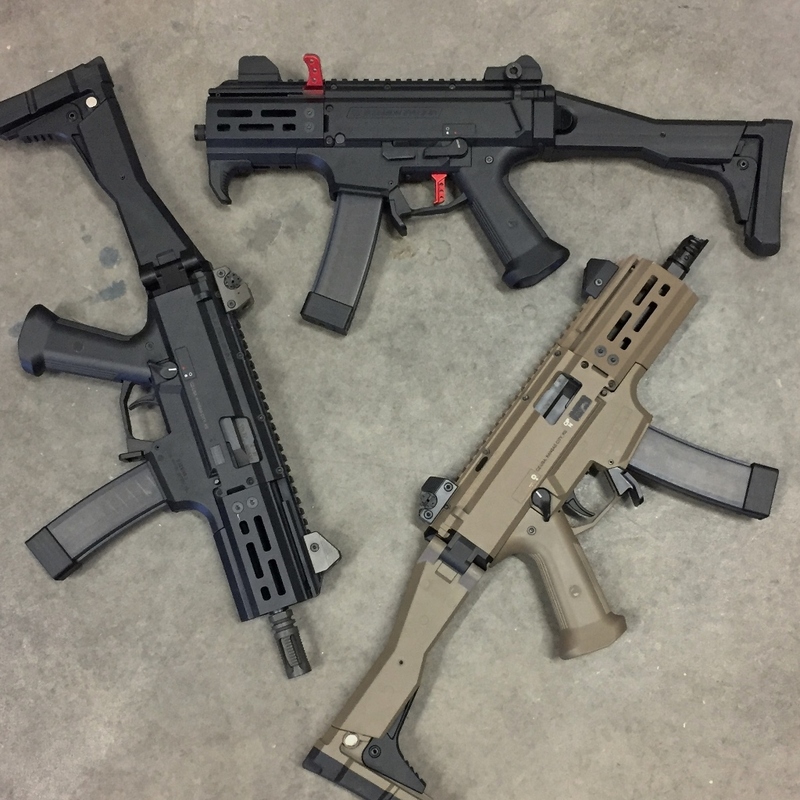 Pic's please ... What is the "CZ Scorpion EVO3 THETA FORWARD Trigger"? I did similar as rhino, but not the k conversion. I used an hbi handguard (normal length and slanted) and an inleadwetrust 3 lug barrel. Same reason, to use with the tirant since I prefer the 3 lug setup. Other than that, flat trigger (just the trigger), some aftermarket charging handle (forget which), pmm qd sockets, factory stock with sbr paperwork, troy micro sights and an aimpoint micro in the larue hk mount. Here's my SBR'd Scorpion Carbine. This was the DIY K conversation before HBI offered the barrels as part of the package. So handy and getting rid of the railed forend & longer barrel makes it so nice, with or without a suppressor. Wholeheartedly agree! With a suppressor this thing is a blast. 922(r) done at the factory for me plus HBI trigger and right hand safety delete. I’m really interested in the CZ-Custom push button safety and I just read, tonight, that there is a binary trigger comming out. The Franklin Armory is also releasing their Binary Trigger for the EVO ... The website will let you pre-order now, says release in September!